The name really says it all. Some guy named Gus makes some damn fine fried chicken, so good in fact that it's become world famous. Maybe the "world famous" part is a bit of a stretch, but it certainly is well-known by anyone who has ever lived in, visited or driven through Memphis. If it weren't for the swarm of cars parked on an otherwise empty street, you probably wouldn't notice the place. 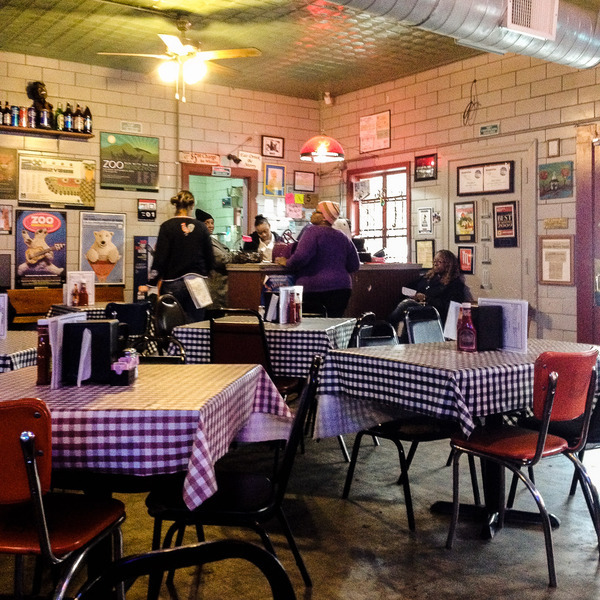 Gus's is situated in the industrial warehouse district of Memphis, just south of downtown and a few blocks away from the Mississippi River. The restaurant is an unassuming brick building with a bright yellow sign and parked cars line both sides of the block. Upon entering the small, square, tile-walled room, we were given our choice of black-and-white-checkered table. The menu is simple; fried any part of the bird you want in various combinations that comes with baked beans, cole slaw and white bread. They've got fried pickles and fried green tomatoes, a few other sides and some classic southern desserts, but Gus's is clearly all about the chicken. Oh and you can sip on a forty (pronounced FOW-TEE) while you munch on fried chicken. They offer forty ounce bottles of Budweiser and Coors Light, along with regular, human-sized bottles of beer. 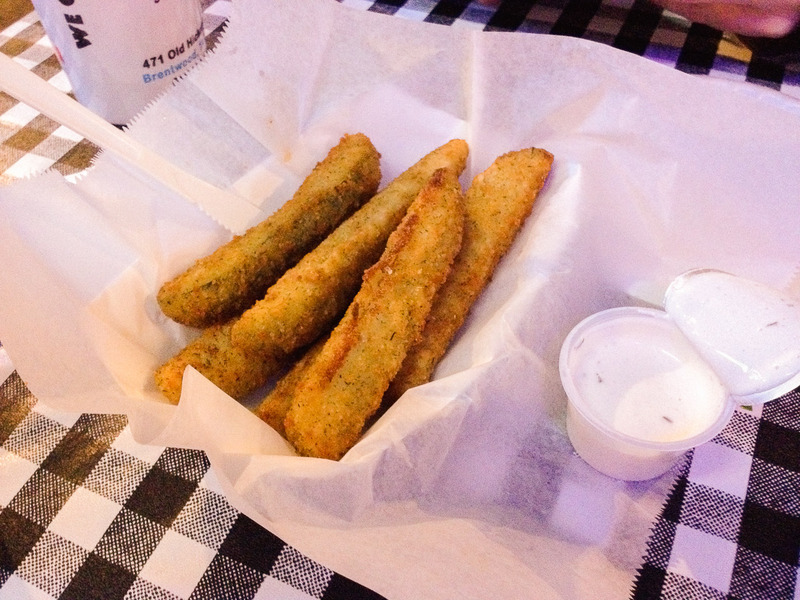 We started off with some fried pickles, because how can you refuse fried pickles? Six long breaded spears in a red plastic basket came out of the kitchen with a side of ranch dressing. They were beyond piping-hot, but we gobbled them up. They pickles were especially dill-y and garlicky, still a bit crisp and the breading was crunchy, salty and sprinkled with dill. Then the fried chicken came. We both opted for chicken tenders (because we're both secretly five years old) which were juicy and moist inside and outside had a super thin crispy coating with a mouth-tingling spicy-ness to it. The baked beans and cole slaw on the side were standard, not particularly exciting. Generic white bread was hiding underneath the chicken; it was even less exciting. After fried pickles and fried chicken, we were stuffed with deliciously bad food and on the verge of food coma. 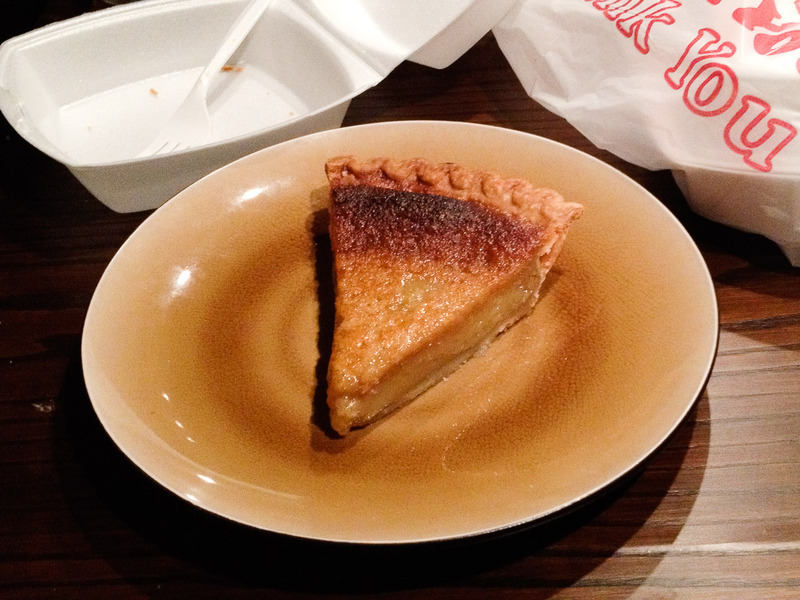 But I couldn't resist a slice of chess pie to take home for later. Chess pie is a very Southern-specific dessert that's texturally similar to pecan pie (minus the pecans) and tastes of butter and sugar. It absolutely must be served warm. After the first bite, you feel like you've been hugged by Santa Claus and tucked into a bed of clouds that's in front of a roaring, crackly fire. Some next-level comfort food. Thank god I don't live in the South. It's a lovely place, but Southern food is so tasty, so fried, so irresistible that I would weigh about a billion pounds if I had regular access to the best barbecue, biscuits and gravy, pecan pie, and fried everything. 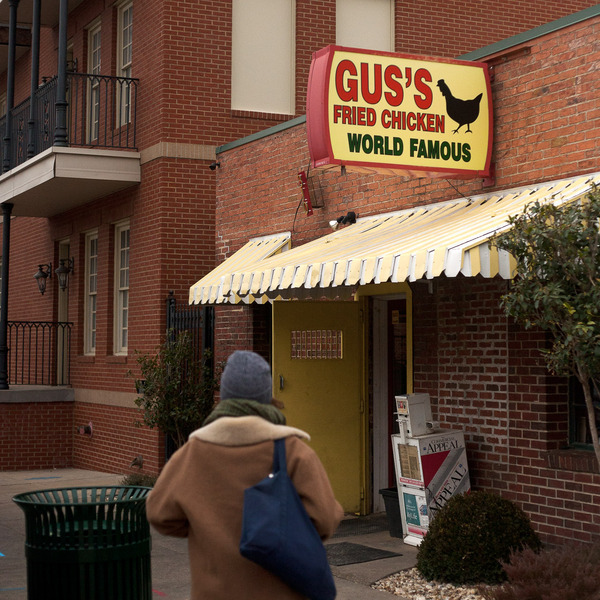 But health and calorie-counting aside, if you find yourself in Memphis, you absolutely must stop for some fried chicken and chess pie from the institution that is Gus's World Famous Fried Chicken. Special thanks to Julia B. (who suggested Eat some pretty rockin' chicken & waffles.) and karenarms (who suggested EAT FRIED CHICKEN) for making this blog post possible!